Note: Take this three day Zhangjiajie tour to experience the wonderful Tianmen Mountain and the spectacular Tianzi Mountain and Yuanjiajie Scenic Area. Take this three day Zhangjiajie tour to experience the wonderful Tianmen Mountain and the spectacular Tianzi Mountain and Yuanjiajie Scenic Area. 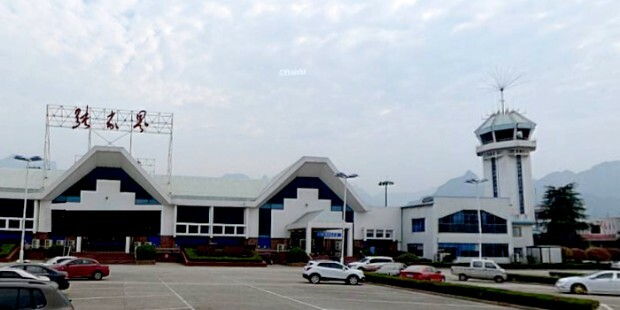 Your guide and driver will welcome you at the arrival hall of Zhangjiajie Airport or Changsha Train station, then drive you to your hotel for check-in. You are free for leisure for the rest of the day. 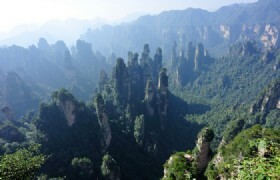 Enjoy the next 2 days exploring the amazing Zhangjiajie and Tianmen Mountain. Remarks: There are bullet trains available from Guilin to Changsha which is only 2-3 hours. You will have breakfast at the hotel and then your guide and driver will meet you at Hotel around 8:30AM -9:00AM. You will then start the full day Zhangjiajie and Tianzi Mountain tour. 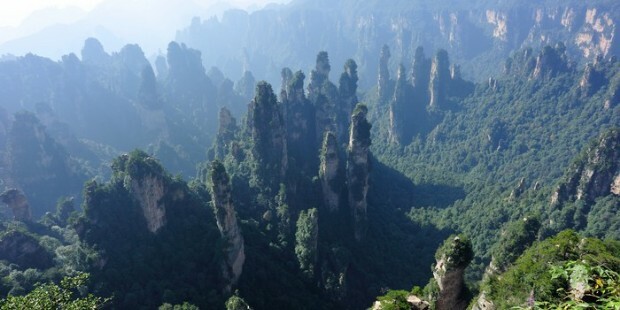 First stop at Zhangjiajie National Park, it is divided into 3 sections: Yuanjiajie, Yangjiajie and Tianzi Mountain. 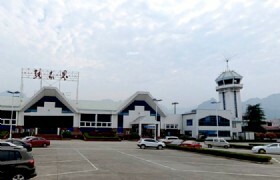 So today we will visit Yuanjiajie Mountain and Yangjiajie Mountain. You will then take the Bailong lift up to Yuanjiajie. Walk around the mountain top for 1 hour to see the No.1 Bridge. Then take the 30 minute coach to Yangjiajie. Hike another 1 hour to Wulong Village and Tianbofu and take the cable car down the mountain and this is where the tour ends today. Zhangjiajie (Bailong Elevator): A glass elevator built onto the side of a huge cliff. It is 1,070 feet (330 m) high. It is claimed to carry 3 world records: the world fastest passenger elevator, the world highest outdoor sightseeing elevator and the world maximum load elevator. First Bridge: The First Bridge is where a 5 meter stone slab naturally wedged between two peaks. The back garden here is known as the "Natural Bonsai" and resembles the royal garden with varieties of pinnacles. Yuanjiajie Scenic Area: Yuanjiajie is famous as the Southern Sky Pillar inspired the floating mountains in the Hollywood blockbuster Avatar. Tianzi Mountain: Tianzi Mountain is named after Xiang Dakun who led the local farmers' revolt and called himself Tianzi---the Son of Heaven. Bounded by Suoxi Valley on the east, Zhangjiajie on the south, Sangzhi County on the north, Tianzi Mountain is one of the four scenic zones in Wulingyuan. It locates on the highest point of "Golden Triangle", its highest point being 1262.5m and lowest point being 534m . Ten-mile Gallery: Located in the Donggou Gorge, Ten-mile Gallery is a 5km scenic road with Wanxing village and Longtan village on each end. With all kinds of sceneries and attractions on it, the road offers an amazing experience of beauty. We will take mini train ride through this picturesque area. Today you will visit Tianmen Mountain by a round trip cable car. You will take a 3 hour walk around the mountain, 1 hour hike through the Skywalk Path and climb up Tianmen Arch. Later today you will be transfer to airport or railway station. Tianmen Mountain: Round trip cable car transfer to the summit of the mountain. Tianmen Mountain Cableway is claimed in tourist publications as the "longest passenger cableway of high mountains in the world", with 98 cars and a total length of 7,455 metres (24,459 ft) and ascent of 1,279 metres (4,196 ft) The highest gradient is an unusual 37 degrees. Tianmen Arch: An 11 kilometres (6.8 mi) road with 99 bends also reaches the top of the mountain and takes visitors to Tianmen cave, a natural hole in the mountain of a height of 131.5 metres (431 ft). 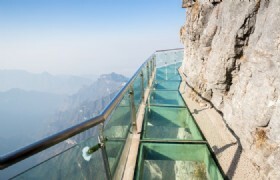 Skywalk Path: Skywalk is built on the side of a cliff on Tianmen Mountain in Zhangjiajie. Skywalk is about 4,700 feet above sea level and 200 and 60 metres long. 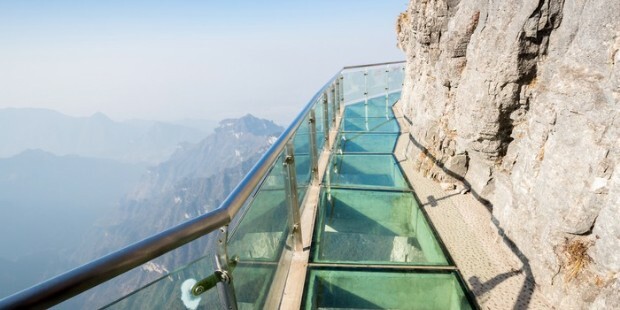 You can walk on kilometres of paths built onto the cliff face at the top of the mountain, including sections with glass floors. * This is a SIC tour, meaning seat-in-coach. You will share a coach with other passengers. Entrance tickets fees to the attraction listed on the itinerary. Coach transfers between airport to hotel to scenic spot: Different customers will share the same air conditioned vehicle with a driver and English-speaking guide.